Republican presidential candidate Rck Perry greets attendees at the Amherst Independence Day parade Saturday. Amid the fanfare and rumbling antique cars of the Amherst Fourth of July parade, candidates for president greeted residents and posed for pictures. Four candidates in total walked the parade route. Republicans South Carolina Senator Lindsey Graham and former Texas Governor Rick Perry jogged energetically from handshake to handshake, often joking with residents. Former Florida Governor Jeb Bush kept a steadier pace behind them. When Graham and Perry ran into each other, the competitors acted as friends. 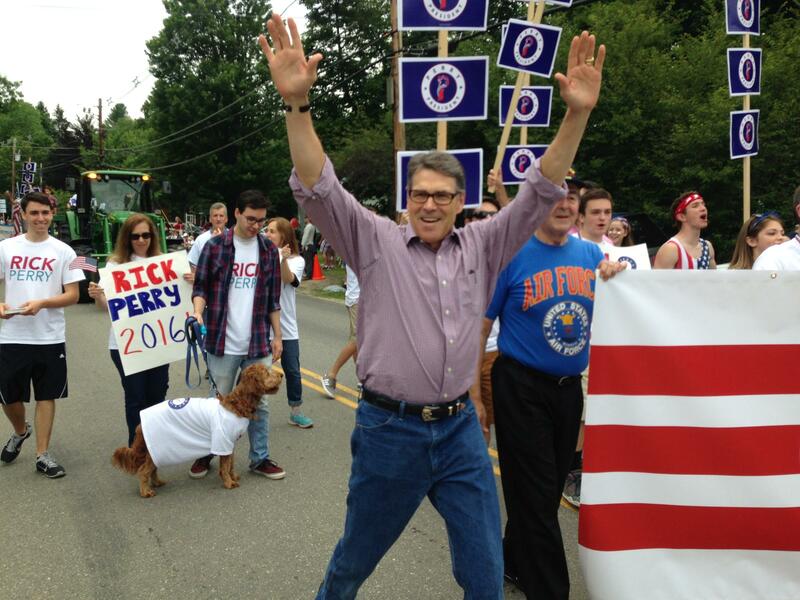 At one point, Perry took a photo of Graham posing with viewers along the parade route. Bush signed objects and picked up toddlers for pictures. Many residents in the crowd said they were supporting him or that Bush was a strong competitor for their vote. Former Rhode Island Governor Lincoln Chafee was the only Democratic candidate to attend the parade, though supporters for other Democrats marched with signs.